This 14" bandsaw will beat the pants off any similarly-priced bandsaws in standard features, quality of construction and fit and finish. The solid cast-iron frame, the table—precision-ground to a mirror-like finish—and the steel open-frame stand make this bandsaw light enough to haul to the jobsite or move around in the shop. Equipped with a 3/4 HP, 115V/230V motor and 5-15 plug, this bandsaw can be used with any standard household power outlet. Includes extruded-aluminum fence, miter gauge, and 3/8" 6-TPI hook blade. Certified meeting UL & CSA standards! Table size: 14" x 14" x 1-1/2"
Floor to table height: 43-7/8"
Overall size: 27 x 26 x 67-1/4 in. Approximate shipping weight. : 165 lbs. I have not had much time to use it up to now but from what I have done so far I am real pleased with the saw. It has performed much better than the one I replaced with this one I could not be more satisfied. Jim K.
I bought this saw to replace a 10" tabletop band saw. This Grizzly saw cuts well and very true. Installation did not take long. Very good directions. I like the size and expandability of it. Looking forward to years of service. I purchased this as a second 14" bandsaw to use as a dedicated 1/8" blade saw, to avoid constant blade changes (from a resawing blade). The saw is excellent for this purpose and congrats to the people who wrote the manual to assemble it. All instructions were clear and consise and I had the unit up and running in about an hour. Works great and quite the value for the price paid. This will NOT be my last Grizzly purchase. Thanks. ---- M.
Assembly was easy, took me about an hour. 2 minutes to get the blade tracking right and have already used it multiple times. I can not give a review at this time . The assembly of the band saw has been difficult with instruction not a clear as need to be. Also parts are not labeled or clear where they go. you need to work on making the instruction clear and picture more useable. Wish I'd ordered a better bandsaw. The fence and blade guides are not very good quality. The blade wanders, and cutting to a line is difficult to impossible. My only criticism is that the blade guides that were supplied were poor. I purchased a set from a different manufacturer and now I don't experience any problems. Other than that, the saw works great. This is a great saw for Harry Homeowner. It cuts small curves in 4" stock easily. Straight forward set-up instructions. Comparable price of lesser quality saws. Very happy with the purchase and delivery. Thanks, Grizzly! I bought this saw to replace a real craftsman which I can't get parts for any more. I love this new saw. I did change out the blade. Easy to set up and change blades on. Will be buying more replacement tools in the near future. Shipment was also very fast. Thanks! I am very satisfied with the bandsaw but I have one problem with it. The rubber tires on the wheels are convex and it makes it very hard to get the blades to track and stay on the wheels. This should be a flat surface. It took me an hour to get a one eighth blade to stay on the wheels. This is not a take it out of the box, add a couple of things and go saw. The setup directions are very poor, and you virtually have to put the whole saw together. The directions say (for ex: "see figure 1). The photo is minuscule and there is no way to see what they are talking about. Maybe someone who goes through a bunch of saws per year would have no trouble setting it up. I did get it together, but it took Wayyyyyyy too long. The blade that came with the saw was the worst I have ever used. It barely cut through anything. Threw it out after just a couple of cuts. I bought this bandsaw about 4-weeks ago and found it to be all I had expected. As a retired machine-tool engineer I had a good idea what to expect and found it to be all or more. There is a few areas like the sheet metal covers which could be somewhat sturdier, but am not complaining. It took quite a bit longer than the 1-hour claimed for assembly, but what else did I have to do? Most of the extra time was being very exact in doing the alignments? I must also compliment the driver of the SAIA deliver truck who was most helpful getting the box into my shop. Any future purchases like this will more than likely be Grizzly! My husband has greatly enjoyed using the saw.. he has made four rocking chairs in the last 3 weeks..
Q: What is needed for converting this machine to 220V? A:First, review the circuit requirements in the Owner's Manual to make sure you have the appropriate 220V power supply circuit and wall receptacle installed in your shop. 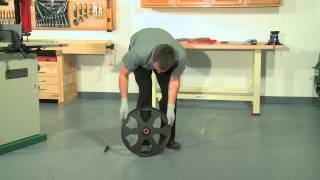 Converting the machine to 220V involves (1) disconnecting saw from power supply, (2) cutting off existing power cord plug, (3) reconfiguring wire connections inside the motor junction box, and (4) installing the appropriate 220V plug (see Owner's Manual for full details). CAUTION: To reduce the risk of electrocution or fire, only an electrician or qualified service personnel should perform this procedure. Q: What is CSA? What does "CSA Certified" mean? A:CSA (Canadian Standards Association) is an organization based out of Canada that is very similar to UL (Underwriters Laboratory) in the USA. Like UL, CSA provides two primary services. First, they develop Canada's minimum standards for the design, construction, and safety of a wide variety of products that are commercially sold in that country. These standards are completely voluntary and not a requirement for all products sold in Canada. Second, CSA acts as an NRTL (Nationally Recognized Testing Laboratory), which is essentially a 3rd party testing agency that has their own engineers/inspectors test and evaluate a product to ensure that it meets the requirements established in the applicable standards document for the primary market where the products are sold. In Grizzly's case, this is the USA and Canada, so many Grizzly machines are certified (usually by CSA, UL, or ETL) to meet both CSA (Canada) and UL (USA) standards. So, although CSA produces their own standards, any NRTL (such as UL, ETL, TUV, etc.) can also certify the same products to the CSA standards. The reason why one NRTL is used over another typically just boils down to a business decision by the company paying the NRTL to test/evaluate their products. An important part of any NRTL certification, besides the initial testing/evaluation, is the ongoing compliance requirements necessary to maintain the certification. This involves both regular and random product checks by the NRTL's inspectors or engineers at the factory or on the consumer level. 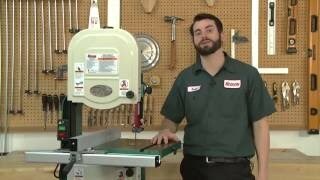 Q: If I put a riser block on my bandsaw, do I lose 6" of adjustment with the blade? A:No, the riser block kits include a replacement guide post and blade guard, which allows the guide blocks to be adjusted within the full range of the additional 6" cutting height gained by its installation. Q: In your catalog, I noticed table inserts being sold separately. Does this mean a table insert won't be included with a new saw? 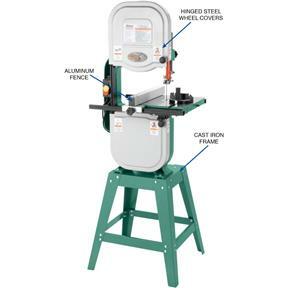 A:No, table inserts are included with all of our new bandsaws. However, over the years we've noticed that a lot of customers like to purchase multiple table inserts, so we just include them on each bandsaw page to make it easier for customers to find and order the correct inserts for their saws.